The cafe is boiling. The atmosphere is clouded with bittersweet coffee. Three years of desire rip through my body and burst from my lips: "Josh!" His head jolts up. For a long time, a very long time, he just stares at me. And then...he blinks. "Isla?" 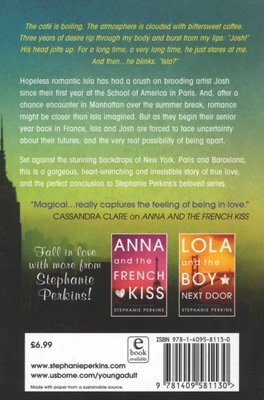 Hopeless romantic Isla has had a crush on brooding artist Josh since their first year at the School of America in Paris. 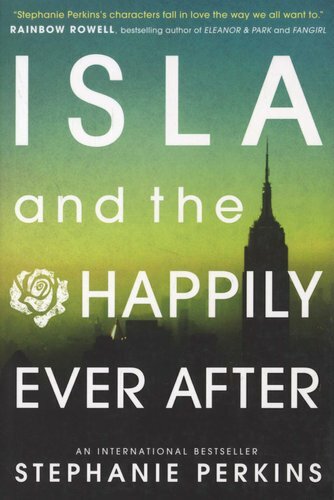 And, after a chance encounter in Manhattan over the summer break, romance might be closer than Isla imagined. But as they begin their senior year back in France, Isla and Josh are forced to face uncertainty about their futures, and the very real possibility of being apart. Set against the stunning backdrops of New York, Paris and Barcelona, this is a gorgeous, heart-wrenching and irresistible story of true love, and the perfect conclusion to Stephanie Perkins's beloved series.